We are living in perilous days. The world has launched a full frontal assault on life, family, culture, and our religious freedom. Over 50 million babies are dead—victims sacrificed at the altar of the culture of death. Marriage and family are under attack by those seeking to pervert our children, the meaning of love, and even the fundamental sacramental institution itself. Our religious freedom is slipping away, as politicians—even some who profess to be Catholic—seek to force us to act against our faith. We need strong and saintly bishops—bishops overflowing with heroic virtue—to shepherd us through these dark days and stand boldly against the overbearing pressures of the world. We need bishops who will call back those betraying politicians, warn them of their peril, and safeguard the body of Christ. We have those bishops now; God has already called them by name. But they need us. They need our prayers, our sacrifices, and our fasting. Join us on this campaign. Together, through our prayers and fasting, let us implore God to grant our shepherds the graces they need to defend the flock. Being baptized members into the body of Christ and His Church, we can regularly offer our prayers and acts of self-denial as a means of strengthening ourselves, assisting others in need, and expelling evil from the Church. Fasting and sacrifice unite us with Christ crucified, Who in turn showers us with His divine grace. Traditionally, fasting is restricting the food that we enjoy eating. However we can also fast from other things in our daily lives such as entertainment, social activities, and the simple pleasures we take for granted. Also effective is fasting from bad habits that have a tendency to lead us into sin. 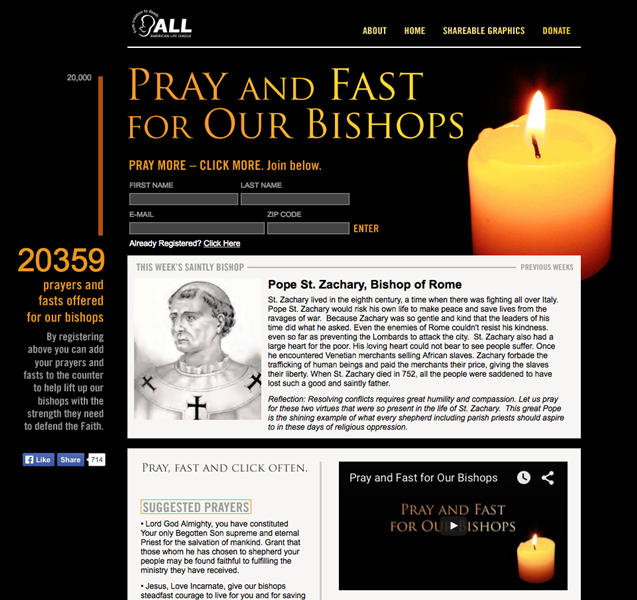 The Pray and Fast for Our Bishops campaign ended in 2014 with over 20,000 prayers and fasts offered.